Robots are fun, and Arduinos are easy. So wouldn't it be nice if there were a kit that included everything you need to get your Arduino device set up to control a simple two-motor-circuit buddy? 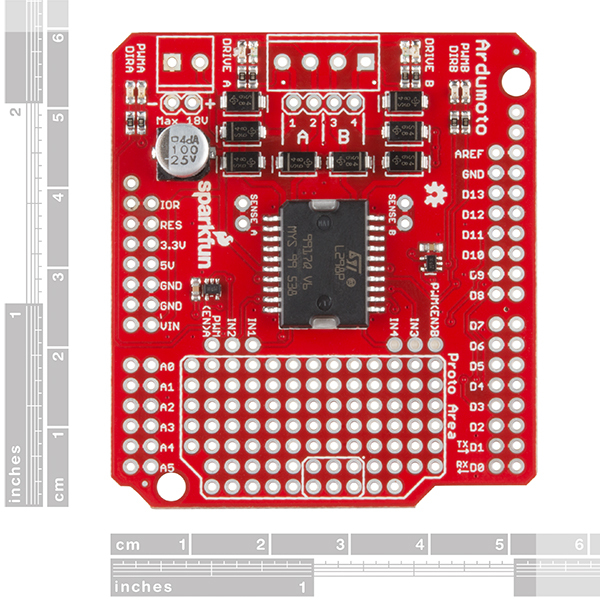 The SparkFun Ardumoto Shield Kit is perfect for any robot enthusiast and includes an Ardumoto Shield, as well as pairs of tires, motors, connectors and wires. And, of course, it’s all stuffed in a classic SparkFun red box (which may come in handy as a robot chassis). 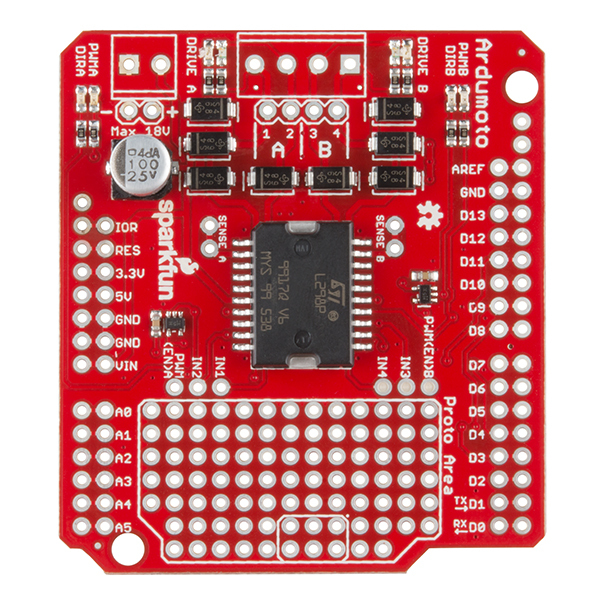 The Ardumoto Shield is an easy-to-use dual-motor controller for Arduino. Combined with an Arduino, the Ardumoto makes a fantastic controller platform for RC vehicles or even small autonomous robots. At the heart of the Ardumoto --- the big, black chip right in the middle --- is an L298, one of our favorite dual-channel motor drivers around, capable of driving up to 2A per channel. The board takes its power from the same Vin line as the Arduino board and includes blue and yellow LEDs to indicate active direction. All driver lines are diode protected from back EMF. Note: The motors included with this kit are not compatible with the Wheel Encoder kit. Sorry for the inconvenience. 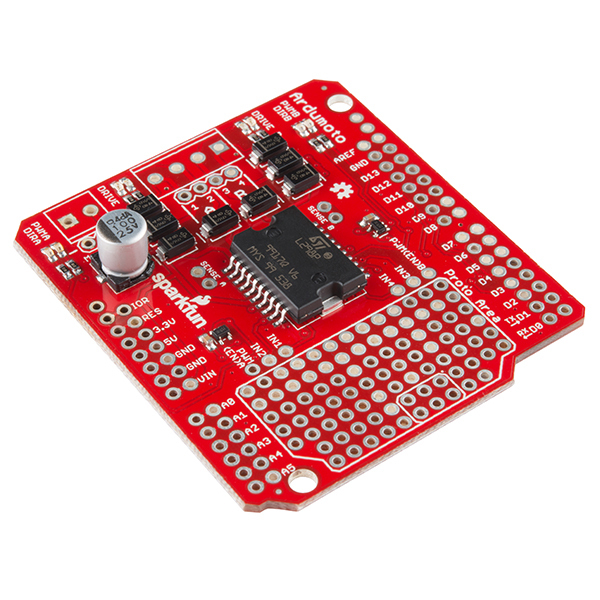 Learn how to assemble and drive DC motors using the v2.0 Ardumoto Shield. Skill Level: Rookie - You will be required to know some basics about motors, basic motor drivers and how simple robotic motion can be accomplished. The main challenge of this kit is soldering on the headers. Most of the rest of the project, including uploading the code to the board, is fairly straight forward. Easy to assemble and test. The only problems is both motors won't run at once when I am connected to my USB for downloading and debugging. I have to switch to battery power for both motors to work at the same time. 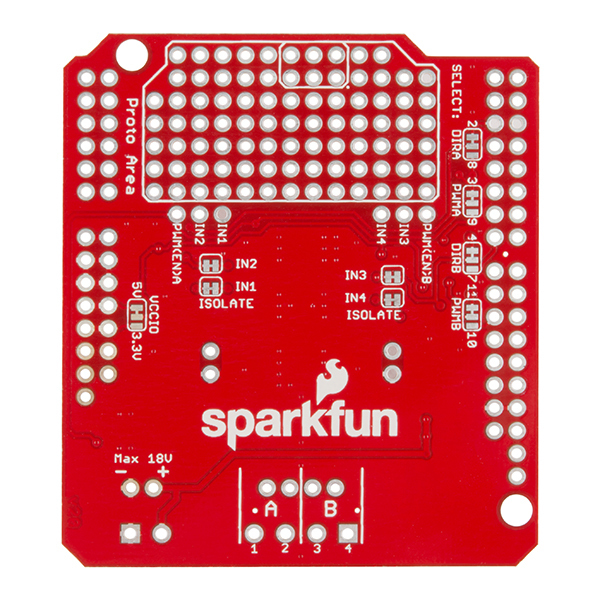 I teach a robotics course in a high school and the Ardumoto shield kit paired up with a SparkFun RedBoard is a solid platform for our explorations. It's not going to take us as far as a full kit-based system like Actobotics, VEX, or Tetrix, but I'm pleased with all we can learn through the Ardumotor kit. For the price, this is the way to go, in my opinion. Cons: * one student of mine shoved the wheel crosswise on the hub, which was near-impossible to take apart. * I'd love to have an on/off switch on the motor shield. We might use the prototyping area to solder our own switch on. * because the shield kit isn't backed by a complete robot construction kit, it's near-impossible to explore building mechanical structures for robots. Can I use Actobotics materials with these parts? * I'd love a version of this kit that is compatible or includes wheel encoders. Overall? I'm thrilled with the Ardumoto kit. We can easily learn from this system for six weeks of high school classes. For the price point, that's an amazing value.